Use one layer of Green Glue between the existing ceiling and an additional layer of drywall, to reduce mid to high frequency sounds like loud voices, television noise, and high heel shoes. Use two layers of Green Glue sandwiched between two additional layers of drywall to give an extra layer of protection against noise coming from above. A layer of Green Glue sandwiched between two layers of sheetrock, and suspended from a resilient clips and channel system, provide solid noise reduction across low and high frequencies. Adding a layer of Green Glue and drywall to the subfloor between the ceiling joists adds extra noise protection against mid to high frequency sounds like voices, pets, and television noise. Filling the space between ceiling joists with two layers of Green Glue Noiseproofing Compund and two layers of drywall, in addition to a clips and channel assembly suspending a Green Glue/drywall combo, will provide superb noise reduction between neighboring stories. Best in class noise reduction is comprised of a floor assembly with Serenity Ultimate Underlay and Green Glue, along with the ultimate ceiling assembly. Attack sound transmission from both sides for serenity and peace of mind. Resilmount A237R sound isolation clips are the go-to clips for soundproofing walls and ceilings. Whether your project consists of soundproofing a home theater, a condominium, recording studio, or even an office, Resilmount A237R clips are an easy to install solution. 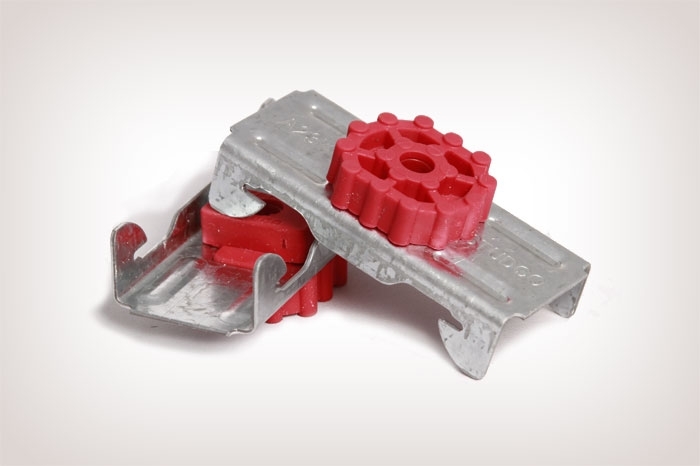 A237R clips work with standard furring (hat) channel and can be installed to wood or steel frame buildings. - Footsteps/foot fall from the floor above. Resilmount's patented thermoplastic rubber outperforms standard rubber because of its unique natural absorbing characteristics. Resilmount's unique sound cell design guards against structure-borne vibrations transferring into the body of the Resilmount because of its strong column design providing a small percentage of contact surface area with the structure or substrate it is fixed to. This aids in absorbing and breaking up airborne sound at its transfer point. Width: 1 - 7/16 in. Height: 3 - 1/4 in. Depth: 1 - 1/16 in. Depth: 7/8 in. or 1 - 1/2 in. Width at Top: 1 - 1/4 in. • Use 25 gauge furring channel on walls. 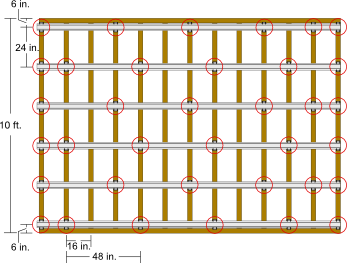 • Furring channel is installed across studs horizontally. • Use a 4 ft. level to ensure furring channel is installed level. • Make sure to leave a 1/4 in. gap between wall and ceiling and wall and floor to fill with acoustical caulk. Measure for placement of Resilmount A237R isolation clips using layout guidelines listed in the Installation Notes above. Mark locations and place clips against the stud. Place washer on clips and install screw through the hole in the center of the clip. Snap furring channel into clips. Some walls will require you to overlap hat channel. It is best to overlap 6 inches of hat channel between two clips. Secure the hat channel with two 7/16” framing screws or 18 gauge tie-wire. 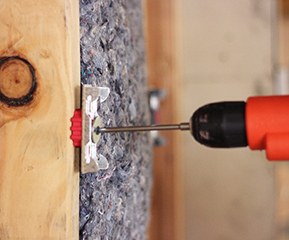 Place shims on the floor to allow spacing between the drywall and the flooring. This ensures decoupling from the floor to make it impossible for vibrations to travel from the wall to the floor and vice-verse. Screw drywall in place through hat channel. Be sure drywall is fully installed before removing shims from underneath. Use acoustical sealant to fill the 1/4" gaps around the perimeter, and all gaps around electrical boxes, windows, and doors. • Use 25 gauge furring channel on ceilings. • Furring channel is installed perpendicular to floor joists. 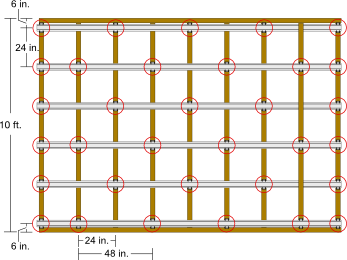 • Clips are spaced no further than 48 inches apart (every 3rd joist if joist are spaced 16 inches OC). • Furring channel must not be spaced more than 24 inches apart. • First and last row of clips are less than 6 inches from the wall. • Make sure to leave a 1/4 in. gap around the perimeter of ceiling to fill with acoustical caulk. Mark locations and place clips against the joists. Place washer on clips and install screw through the hole in the center of the clip. Some ceilings will require you to overlap hat channel. You can overlap 6 inches of hat channel between two clips. Secure the hat channel with two 7/16” framing screws or 18 gauge tie-wire. Have one person lift and hold the drywall in place. Have a second installer screw the drywall directly into the hat channel using a power drill. Leave a 1/4" gap around the perimeter of the ceiling. This ensures decoupling from the wall to make it impossible for vibrations to travel from wall to floor and vice-verse. Use acoustical sealant to fill the gaps around the perimeter of the ceiling, and around any lighting fixtures and vents.